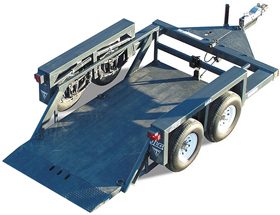 TRIPLE-L utility trailers load as quickly and easily as flatbed models, with the added convenience of enclosed sides. These dual-purpose models are ideal for carrying equipment or supplies. 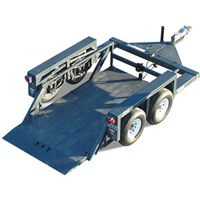 A full width, low angle ramp allows for easier loading with a handcart or dolly. Keeps all loading and unloading at ground level. Eliminates chances of dropping cargo off ramps. No climbing to access machine tie-downs.